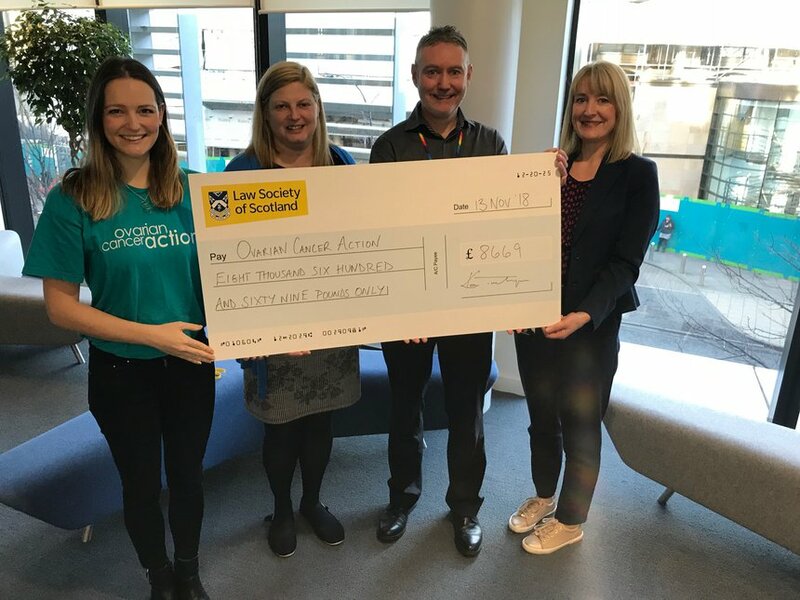 The Law Society of Scotland celebrated a successful charity of the year partnership with Ovarian Cancer Action at their offices in Edinburgh earlier this month, raising an incredible £8669 in memory of much-missed colleague Jeune Robertson, who sadly passed away from the disease last year. The company organised a huge variety of fundraising activities to help fund our vital research and awareness work. From bake sales and raffles to marathon relays, cycling challenges and even walking the Water of Leith in the snow, colleagues at the Law Society put their heart and soul into fundraising for a cause close to their hearts. Daisy Woolfrey, corporate partnerships manager at Ovarian Cancer Action said: “We are delighted to have worked with the Law Society of Scotland for the past year. We’re a small charity, but an ambitious one. And we are acutely aware that we wouldn’t be where we are today without supporters like this. We’ve been so impressed by the Law Society’s unique fundraising approach to the Charity of the Year partnership and their determination to reach their fundraising target of £7000 and then absolutely smashing it! Does your company or employer nominate a 'Charity of the Year'? Why not consider Ovarian Cancer Action? A nomination gives us the clout we need to raise more funds. And more money means more investment into research that can save lives. Contact daisy@ovarian.org.uk for more information. Whether big or small, there are lots of actions you can take to get your workplace involved.